Azteca Siete has confirmed that Rosario Tijeras will have a third season next year, after leading Mexican ratings this Sunday with its second season finale. 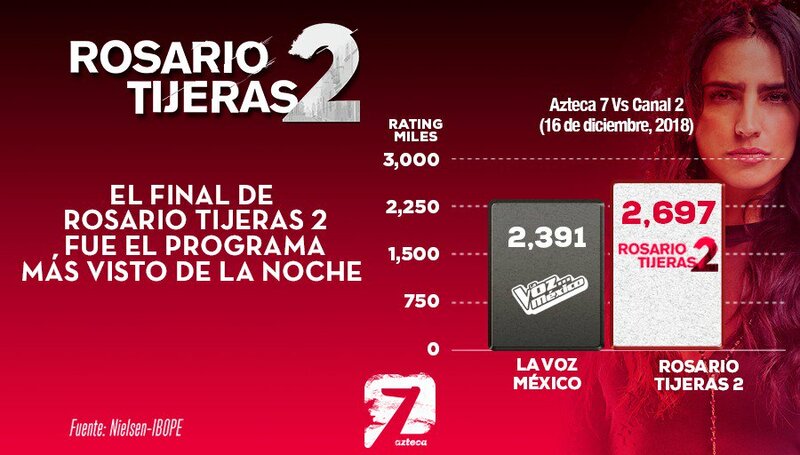 As it did with its premiere, Rosario Tijeras led Mexican ratings as it bowed last Sunday 16 on TV Azteca. According to data revealed this Monday, the second season finale reached 2.697 million viewers, while runner-up La Voz…México, on Televisa’s Canal 2, had 2.391 viewers. Furthermore, as soon as the series was over, Azteca Siete officially announced that Rosario Tijeras would be back on their screen for a third season in 2019. Rosario Tijeras stars Mexican actress Bárbara de Regil. The cast also includes José María de Tavira, Sebastián Martínez, Hernán Mendoza, Mario Loria, Verónica Langer, Fernando Ciangherotti, Christian Chávez, Claudio Lafarga, Yolanda Ventura, Dany Perea, Mario Loria and Ignacio Riva Palacio. The series is produced by SPT Latin America, based on the Colombian series of the same name. TNT aired Season 2 for all Latin America almost simultaneously with TV Azteca.